The Metropolitan Museum of Art is something of a labyrinth—a vast collection of galleries within galleries. On a morning in the middle of the week after Christmas, the Met was full of visitors from around the world drawn to the permanent collection as well as to various blockbuster offerings: a David Hockney retrospective, and “Michelangelo: Divine Draftsman and Designer.” Two shows at opposite ends of the main building offered retreats from these throngs—and cultural revelation and enlightenment related to empowering adornments. 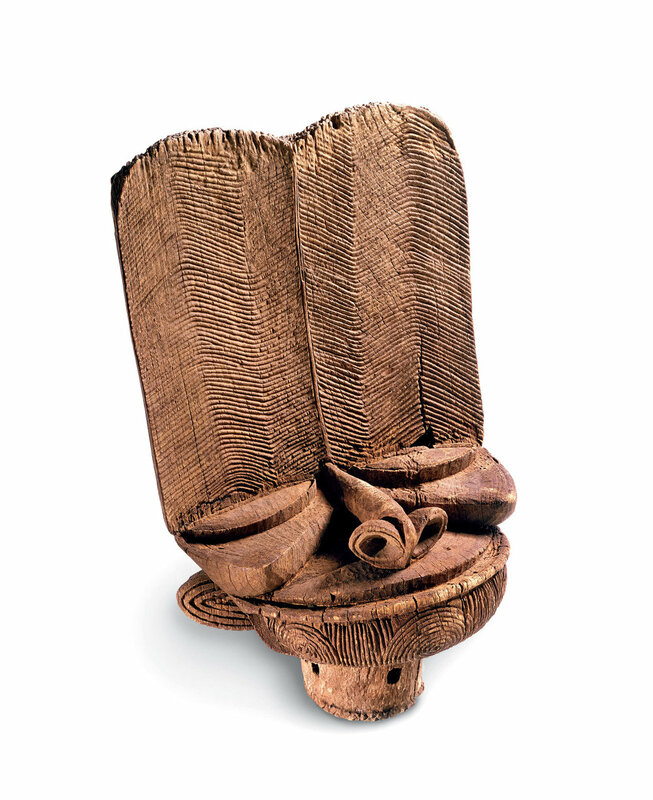 CREST (TSESAH) of wood, Bamileke, Cameroon, 91.8 × 57.8 × 33.0 centimeters, late nineteenth/early twentieth century. The Menil Collection, Houston. Photographs courtesy of the Metropolitan Museum of Art. Tucked in among the displays in the Arts of Africa, Oceania and the Americas section of the museum is “The Face of Dynasty: Royal Crests from Western Cameroon” (through September 3, 2018). The inspiration for the show was the Met’s acquisition in 2017 of an eighteenth-century monumental royal crest, or Tsesah, carved by an unknown artist from the Grassfields region of the Central African country. The museum borrowed three additional crests—out of a total of fifteen known extant examples—from the Smithsonian Institution’s National Museum for African Art, the Menil Collection and a private collection. According to the curators, this first-ever display of more than one Tsesah in a single show offers an opportunity to appreciate their formal qualities “comparatively.” While the four crests share certain design characteristics, such as their “bombastic facial features” and soaring, expansive brows incised with linear patterns, they vary in size and condition. Some of them have been crudely but deftly repaired, yet they remain imposing, their earthy textures lending them a timeless quality. Deep within the Met’s Asian Art section, the penetralia, as it were, of the northern end of the building, “Crowns of Vajra Masters: Ritual Art of Nepal” (through December 16, 2018)offers a stunning arrangement of five elaborate crowns, symbols of ritual authority worn by the hereditary caste of Vajracharyas, the highest ranking figures in Nepalese Buddhist community (the name is translated as “thunderbolt scepter master”). VAJRACARYA PRIEST’S CROWN of copper, gold, turquoise, semiprecious stones, silver foil, Nepalese, 34.3 x 21.7 x 23.0 centimeters, circa fifteenth/sixteenth century. Rogers Fund, 1948. Collection of Metropolitan Museum of Art. The crowns in the show represent the five Transcendent Buddhas of awakened wisdom. The curators have arranged the crowns in a mandala configuration, with paintings and various objects of ritual performance surrounding them. Entering the darkened room is something of a religious experience—not a temple, per se, but a place of intense and remarkable sacred imagery and imagination. The ornate dazzling crowns, which date from the thirteenth to the eighteenth century, are made of gilt copper with applied repoussé medallions that have been set with semiprecious stones, crystals, rocks, and coral. They were worn by bodhisattvas, perfected beings possessed of compassion and spiritual wisdom. Four of the five crowns are from the Met’s collection; the fifth was borrowed from the Virginia Museum of Fine Arts. Each conical crown varies in its iconography and decorative elements. A crown from Nepal’s early Malla period (thirteenth/early fourteenth century) features a series of diadem plaques that depict the bodhisattva Manjushri accompanied by smaller plaques of gift-granting goddesses. By contrast, the most recent crown in the show, dated 1717, has no figurative elements and is the most highly decorative, with a profusion of lotus flower plaques and floral bosses. Nearly all the crowns are surmounted by a stylized thunderbolt—the vajra—scepter, its five prongs sometimes resembling the beaks of birds. The pieces also vary in their construction, but the metalworking is consistently outstanding. Some elements are riveted to the crown, others are cast. The stones also differ from piece to piece: the VMFA collection crown features a diadem band inlaid with a rich blue lapis lazuli while several others are accented with turquoise. The crowns are complemented with an array of Nepalese objects equally stunning in their imagery and creation. Distemper-on-cloth mandalas offer elaborate representations of deities, including the wrathful Chakrasamvara with his embracing consort, Vajravarahi. A couple of mandalas depict the fearsome sword-wielding Acala (translated as “immovable”) who is said to be able to cut through the veil of ignorance. Other objects in the show relate to the ritual offerings made by the Buddhist priests. There is an iron fire-offering ladle inlaid with gold and silver; a libation conch, which is used to pour blessed water during Vajracharya ceremonies; and a brass ewer with a spout in the form of the sea creature Makara. In both the Tsesah and Vajra shows, one comes away with a sense of awe. Whether the impulse to create these astonishing adornments came from a need to display power or express belief, the individuals who carved and cast these objects were masters of their arts. The Met exhibitions help give them their due. “The Face of Dynasty: Royal Crests from Western Cameroon” and “Crowns of Vajra Masters: Ritual Art of Nepal” show through September 3, 2018 and December 16, 2018, respectively, at the Metropolitan Museum, New York City. 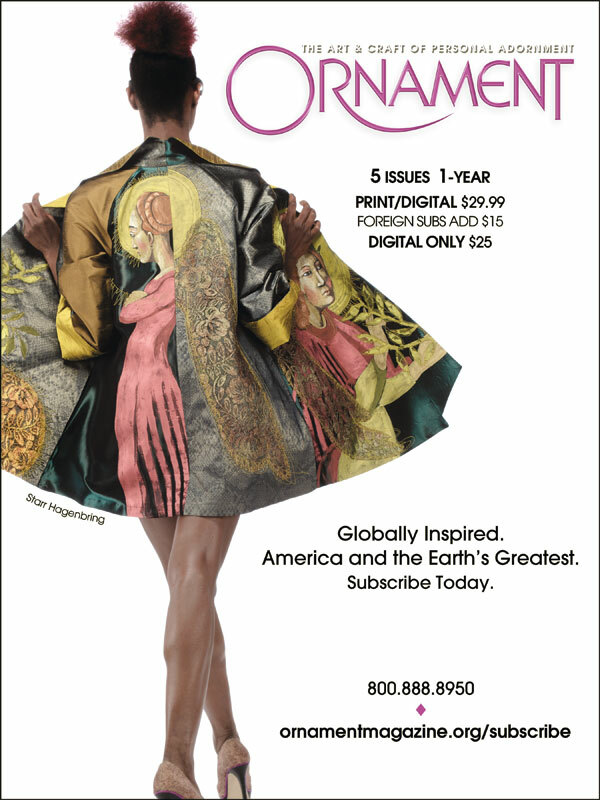 Carl Little, after submitting his reviews for this issue, joked about the complexities of navigating the vast Metropolitan Museum of Art, saying that “I considered leaving behind a trail of bread crumbs.” He relied on guards to guide him to two remarkable shows: “The Face of Dynasty: Royal Crests from Western Cameroon” and “Crowns of Vajra Masters: Ritual Art of Nepal.” Paintings of Portland, Little’s third collaboration with his brother David will be out in June. The two brothers also recently worked together on The Art of Arcadia, celebrating the founding of the national park in Maine. Support the Arts. Tell Our Advertisers You Saw Them in Ornament.